In a quiet side street in downtown New Haven sits the Istanbul Café, a seemingly unassuming restaurant. But walk inside and you are transported halfway around the world to the historic Turkish city. Istanbul, then called Byzantium, was founded by Greek settlers around 660 BC and had its name changed to Constantinople, by Constantine the Great, when he made the city the new eastern capital of the Roman Empire in 330 AD. As you might expect from such a rich cultural history, the food has evolved over the centuries into something both unique and splendid, and the Istanbul Café provides an amazing and authentic dining experience. The restaurant, which has been open since 1998, is owned by Murat Firidin who is the chef, and his wife Gulay, who acts as hostess. Both hail from Istanbul, and the interior is a perfect recreation of what you might see there. It’s an ideal size, neither too small or too large, with exceptional ambient lighting. And the food? Well where to begin? If you haven’t eaten authentic Turkish food before then you are in for a treat. Healthy and flavorsome dishes abound, and be daring, order something you have never heard of - it will be delicious. Mücver, combines zucchinis, crumbled feta cheese and dill into a fritter, that is served with a generous covering of low-fat yoghurt ($7 for four fritters). The texture of the zucchini and the ingenious addition of dill, make this delightful dish a real treat. Yaprak Dolma, another appetizer, was perhaps my favorite dish of all. 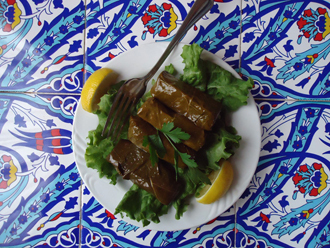 A blend of rice, lightly browned onion, fresh dill, pine nuts, sweet black raisins and mint are wrapped in Grape leaves and lightly cooked in olive oil over a gentle fire. This colorful vegetarian dish is quite like nothing I have tasted before. The textures and flavors are sublime. A must have and a steal at just $7. For larger parties, try the Soguk Meze ($15 for small, and $19 for large) which is a selection of six appetizers and is quite filling and would make a perfect lunch for two. 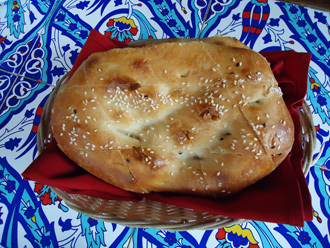 Special mention must go to the bread, the Turkish equivalent of pita bread, which is only eaten during Ramadan in Turkey. But it has proven so popular with patrons that it is now served all year at the Istanbul Café. Even if you are watching your carbs, indulge yourself - you won’t regret it. 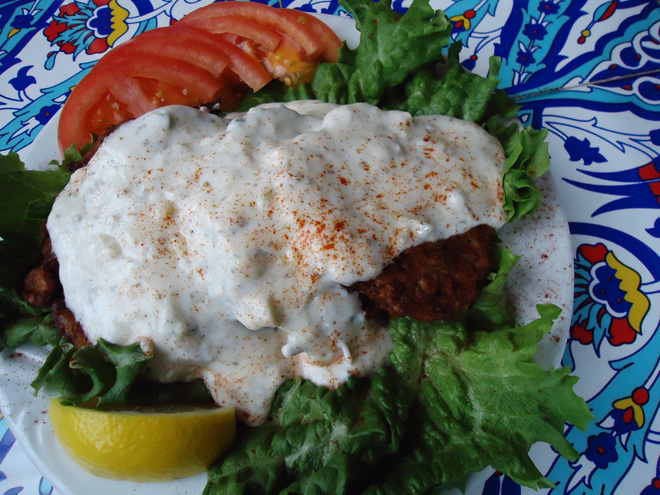 Of the many main courses, the Yoğurtlu Kebab ($17.50) immediately caught my eye. A chicken, lamb or Adana kebab is laid out over pieces of bread freshly baked by Adnan in the kitchen and generously laden with spiced tomato sauce and cool yogurt. Healthy and delicious; what’s not to like? The Adana kebab ($15) comprises lean minced lamb, tinged with a spicy vegetable sauce, which is then skewered and slowly cooked over a charcoal fire. Served over rice, this kebab quite literally melts in your mouth. If you go at lunch time, all kebabs are served as half portions at half the price. 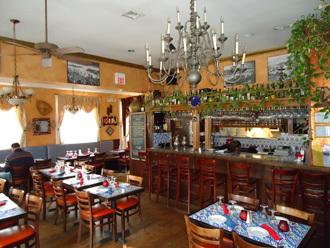 The Istanbul Café is a real find and Gulay helps provide a relaxed, yet fun dining experience. Would I go again? I already have.